German food retailer Netto Marken-Discount has launched “Die Oster Überraschung — Der Wahre Osterhase,” (The Easter Surprise — The True Easter Bunny). The Easter Surprise commercial explores the question, “Where did the Easter Bunny come from?” The concept of a hare or rabbit distributing decorated eggs on Easter Sunday can be traced back to customs found in Lutheran Germany. This animated film provides a fantasy take on the custom. The Easter Bunny’s origins are explained in a marital union between a hen and rabbit who give life to a bunny that can lay coloured eggs. After his egg-laying skills are ridiculed by other forest creatures, the bunny runs away to the human city in the distance, leaving his worried parents behind with nothing more than a newly laid easter egg on his bed. He is soon picked up by a young girl and made famous in the human world, making headlines with the uniqueness that had previously left him feeling isolated. However, before long, he begins to miss his parents and his old world, leading him back to his family and providing the viewer with a fairytale, perfect ending. The Easter Surprise campaign is online at www.netto-online.de/ostern. The Easter Surprise campaign was developed at Jung Von Matt by executive creative director Dörte Spengler-Ahrens, creative director Andreas Hilbig, senior art director Andreas Ristau, junior copywriters Adel Abouelfetouh and Clemens Wolff, junior art director Vlad Tarziu, senior project managers Julia Matczak and Alexandra Schöne, managing director Stephan Giest, producers Dennis Wendt, Christopher Kehrhahn, account directors Natalie Hoffmann and Natalie Martens. 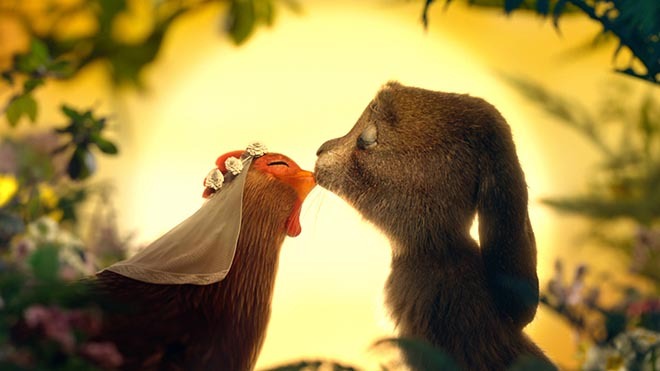 The Easter Surprise commercial was produced at Mill+ by director Jimmy Kiddell, director of photography Tim Green, head of content Josh Davies, producer Terri Wood, production manager Jo Coombes, 1st assistant director Marc Wilson, production designer Dan Betteridge, and lead model maker Kate McConnell. VFX, design, editing and colour were produced at Mill+ and The Mill by creative director/concept artist Jimmy Kiddell, executive producer Reece Ewing, producers Rebecca Perry, Justin Stiebel, head of animation Jorge Montiel, 2D lead artist Pete Hodsman, 3D Lead/VFX Supervisor: Jonathan Wood, 3D lead animator Alberto Lara, art director Melanie Climent, 2D artists Gianluca Di Marco, Jorg Schulz-Gerchow, Rafael Vormittag, Eleanor Risdon, Charles Dockerill, 3D artists Ashley Reemul, Jasmine Ghoreishi, Sauce Vilas, Antoine Mariez, Philippe Moine, Aziz Kocanaogullari, Luca Cantani, Ashley Tilley, Clement Granjon, Margaux Huneau, Jacob Gonzales, Nico Domerego, Anthony Bonnard, Antonio Filippin, Pavel Mamichev, Vladamir Venkov, Hugo Jackson, Jacques Leyreloup, Josh Docherty, Andreas Graichen, Thomas Bourret, Lucie Martinetto, Perrine Renard, Alain Thay, Walter How, Francesco Pelosi, Andrew Bartholomew, Lavan Kumar, Vittal Kuntla, Sivasubramanian, concept artists Melanie Climent, Andrew Brooks, Grant Berry, matte painter Cameron Johnson, R&D officer Craig Davies, colourist Seamus O’Kane, editor Hugo Vaughan-Hughes. Music is “Beautiful, Always”, composed by Stephan Altman, Roisin Malone, Simon Heeger, Christian Vorländer at 2WEI with executive producers Simon Heeger & Christian Vorländer, sung by Tal Altman. Sound was designed by Thomas Muis at 2WEI.